Sid Meier’s Civilization III includes an easier-to-use interface for streamlined management and better control. 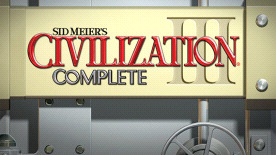 Civilization IIII: Complete includes: Sid Meier's Civilization III, the highly-addictive journey of discovery, Civilization III: Play the World, the enhanced multiplayer expansion pack, as well as all of the great new civilizations, scenarios, and features from Civilization III: Conquests. Sid Meier's Civilization III: Complete provides more ways to explore, more strategies to employ, more modes of play, and more ways to win, all in one box. Advanced trade system: manage resources, trade routes and spread of technology. Improved combat options: finer levels of control for enhanced war-making capabilities. Expanded Scope: New Technologies, Wonders of the World and Great People. New elements of Culture, Nationality and the Arts: plan a new peaceful pathway to victory. Active world generator: experience more realistic maps and organic terrain features.